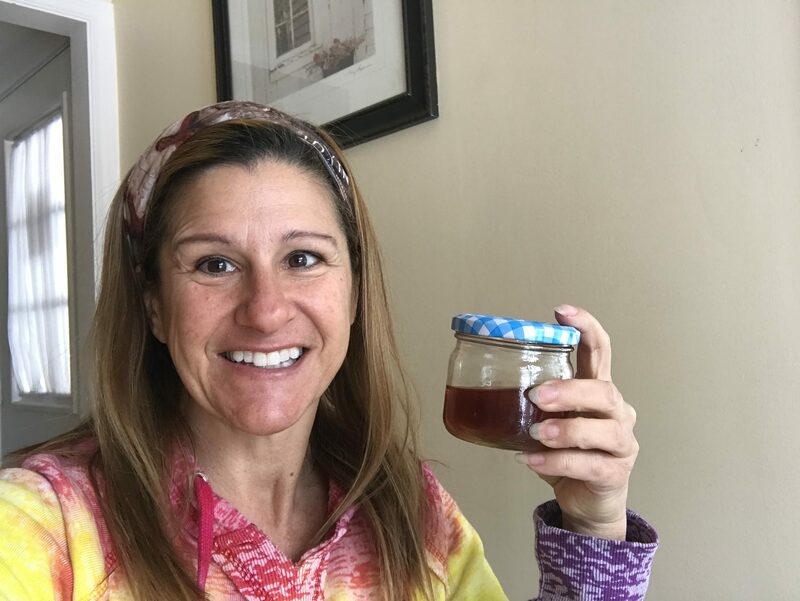 When I finally finished making my maple syrup I was incredibly proud. I was also really happy, that it was over. It was a very very long process as far as the boiling went and I know that was due to my inadequate heat source but it didn’t make it any less long. 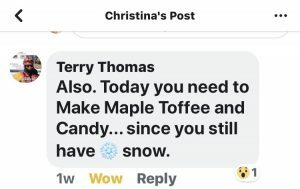 I was about to close the book/blog/video on the whole maple syrup series, until a friend, Terry Thomas commented on my facebook post, then private messaged me to tell me all about making maple candy and that now I’d made the syrup, making the candy was a must. Of course, I had to rise to the challenge so I did a bit of research online about how to make it along with some information from Terry and the next weekend, I gave it a go. 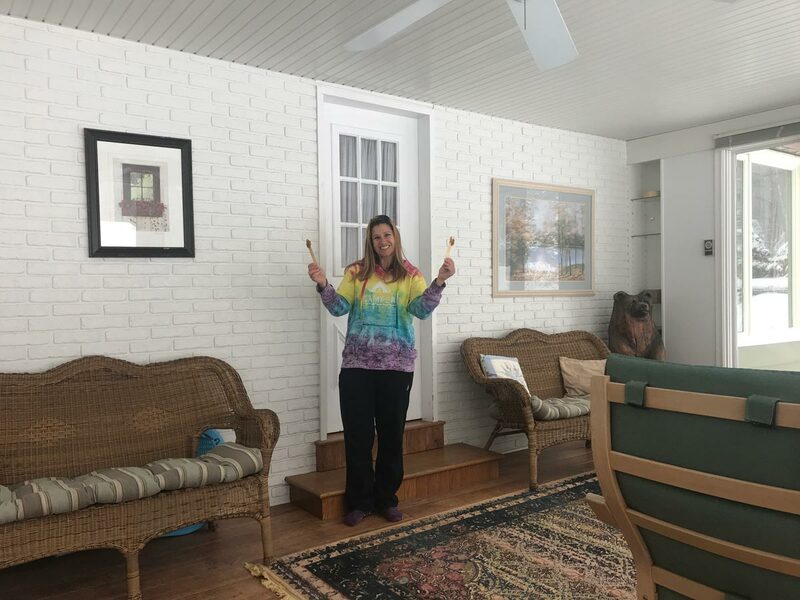 My good friend from Niagara, Beth, was supposed to come and visit but due to the horrible forecast anywhere from there to here, she decided it best not to come. I agreed, but I didn’t have to be happy about it. The roads were not in the best shape and since I had no where to be, I decided it would be a good time to test out making maple candy. After reading the instructions of how to do it, it seemed pretty simple and figured even I couldn’t mess this up. Hahaha, I was so wrong about that. I didn’t want to waste my syrup as I had enjoyed it on my french toast and pancakes and wasn’t sure if I’d like the candy, so I decided just to make a small amount, using only 1/4 cup of syrup. I poured the syrup in a pot and put it on simmer and got deja vous, waiting, waiting and waiting some more, kind of like last weekend but not quite as long thankfully. I had my candy thermometer out that I’d purchased for the making of the maple syrup and besides the teeny tiny jars I’d bought to put the syrup in, it was my only purchase for that project, thanks to my friends Eileen and Dan who’d loaned me the rest. The thermometer was to go up to 235° to make the candy but there was so little syrup in the pot, it was very hard for me to get a reading on the thermometer as it didn’t quite reach the bottom of the pot. I had to tilt it and that would work but then the syrup would stop boiling when I did that, and I’d have to heat it all over again, so it was a bit tricky. After about a half hour or so of waiting, the syrup finally turned really thick and foamy and looked like cappuccino foam. The thermometer was pretty much up at the right temperature so I picked up the pot and a spatula and headed outside into the winter wonderland (aka snow storm). I had the phone/camera in one hand, the spatula in my pocket, and the pot in the other hand. I hadn’t quite figured out how I was going to do this and now I was outside, the syrup was getting cold instantly from the heavy falling snow and cold temperatures and I still needed to pat the snow down. I did the only thing I could and put the pot down on the ground, also in the snow, and patted the snow down quickly with the spatula to make a nice flat surface. Then I quickly grabbed the pot and poured, but surprisingly, nothing came out! The syrup was already hard and totally stuck to the bottom of the pot as the snow was cold and it got hard instantly. OMG! I was soooo upset. I went back inside determined and put the pot back on the stove hoping it would remelt. I wasn’t too happy with this simple project I had attempted and wanted to now get it right. So, I of course, poured out another quarter cup of syrup into a pot and started again. URG! I’m sure I could use the maple rocks for something in the future, but maple candy is what I tried to make and I was going to make maple candy, one way, or another. It took a while again for the syrup to heat up. Once it got all foamy as it had been before I turned the burner down and ran outside. I patted the snow down again. It had been snowing so much that the other area I had patted down was already covered in fluffy new snow. It was really coming down. I then set up the camera on my selfie tripod and left it there and running and went back in. I then set up the camera on my selfie tripod and patted down the snow. Then I left it the camera there and running and went back in. I got the syrup back up to a nice foam and ran outside pouring the syrup right into the snow as soon as I got outside. It worked! Or it looked like it should work? I put the pot down as soon as I’d gotten out as much syrup as I could. I had not brought a spatula to scrape out the bottom of the pot as I had been too scared to wait an extra second this time and loose the syrup/candy again. I reached into my pocket and got out the popsicle stick I’d put there earlier, aka, tongue depressor which is what I had on hand, and began rolling up the gooey syrup onto the stick. So far, so good! I got out another stick and attempted it again, still good. YES! Now I had two maple candysicles and still some syrup left on the snow. I attempted to roll up a 3rd stick, but the candy cracked and was brittle almost instantly. That was okay. I took the candy in a piece and the two sticks with maple candy on them and went back inside. SUCCESS… I think? I put the candy in the fridge to continue cooling as it was covered and intertwined with snow that was now melting and running down the sticks. After I cleaned up my dishes etc, I took it out to give it a look and have a taste test. It was so good! I was very happy I’d tried again. I would find something to use the maple rocks for which was basically maple sugar now, I guess, and I would enjoy the candy as is. I was actually surprised how much I liked it and continued grabbing pieces of it until it was all gone. Thanks so much to Terry Thomas for the idea to make the maple candy. I was a bit hesitant to try it, but glad again, that i’d done so and gave it a second try when my first attempt didn’t come out quite right. If you have never tried maple candy, I suggest you give it a go. I’m not a big candy person, more of a chocoholic, but I was surprised by how much I enjoyed the maple candy, maybe even a bit more than the syrup? Hmmm? LOL. I hope you enjoyed my Making Maply Syrup/Candy series and it has inspired you to try something new. If you have any questions, comments or just want to say hi, please leave a message. Hopefully, my posts will soon include some camping. My PCS (post concussion syndrome) is improving day by day, and I am hoping to be out on the water by the time it unfreezes, or, shortly there after. It seems he weather has been helping me stay home, but for the record, I’m not happy about it, regardless. Oh my, looks so yummy, good job Christina, never giving up!